I wandered lonely as a cloud. Nearly everybody loves Daffodils, a member of the Narcissus genus; other commonly grown members include Jonquil, Lent Lily, and Hoop Petticoat. Narcissus are usually grown from hardy bulbs, and range from 7 to 45 cm (3 to 18 inches) in height. They have long leaves, and a cup or trumpet shaped middle surrounded by a ring of petals. Narcissus flowers are usually yellow or white in colour and bloom in the spring. When do Daffodils bloom? Daffodil flowers in the spring. Narcissus flower pictures by tibchris. Narcissus pseudonarcissus (Wild Daffodils, Lent Lily) photograph by amandabhslater. Common Names: Daffodil, Jonquil, Hop Petticoat, Lent Lily. Height: 3 to 18 inches (8 to 45 cm). Native: Europe. Western Asia. North Africa. Flower Details: Yellow, Orange, White. Trumpets; Cup-shaped (framed by ring of petals). From one to twenty flowers per plant. Foliage: Leafless stems. Slender. Long. Grow Outside: Usually started from Narcissus bulbs; it can take up to eight years for seed grown Narcissus to flower. Seeds: Cover. Late summer or autumn using fresh seed. Germination time: one to two months. Seeds should first be sown into flats. Next sink the flat into the ground in an area that offers shade, preferably close to a wall that faces north. Provide a glass/plastic covering. Keep an eye on the flats to ensure that the soil remains moist and to check if seedlings have emerged. After two years of growth, transplant the seedlings to their final location in the autumn. Spacing 4 to 8 inches (10 to 20 cm). Bulbs: 3 to 6 inches (8 to 150 cm); depending on size. Late autumn in warm areas; End of summer and the start of autumn in cooler areas. Requirements and care: Full sunlight. Good drainage. Soil pH 6.0 to 7.5. Ordinary soil enriched with bone meal (or a fertilizer that is low in nitrogen). Regular watering during dry periods until flowering has completed. Provide a spring feed. Cut back the stalk (not the leaves) once flowering has finished, but before the plant has had chance to set seed. Allow leaves to wilt completely before removal. Propagate: by dividing in late spring once leaves have wilted. Miscellaneous: Linked to the Greek myth of Narcissus, a beautiful hunter who became so obsessed by his own looks that he knelt and gazed at his reflection in a pool of water. Then, depending upon the story, he either fell in and drowned, or was so captivated by his own reflection that he died of thirst and hunger. Narcissus plants grew in the spot where he perished. 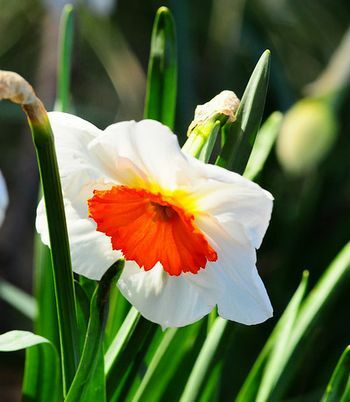 It is easiest to grow Daffodil and other Narcissus members from bulbs. When planting daffodil bulbs they should be buried about 7 to 10 cm (3 to 4 inches; small species) to 12 to 15 cm (5 to 6 inches; large species) deep in the autumn. They should be spaced about 10 to 15 cm (5 to 6 inches) apart. When planting add bonemeal to the bottom of each hole. Daffodil likes to grow in sunny areas for best flowering. Ideally the soil should be of pH 6 to 7.5 and have good drainage. If growing from seeds outdoors then use fresh seeds (end of summer), sow into flats, and lightly cover the daffodil seeds. The flats should then be sunk into a shady part of the garden and covered with glass (keep moist). Germination should take about 4 to 8 weeks. Allow the daffodil seedlings to grow for a further two years before transplanting in the autumn. It will take at least three, and up to nine years before seed grown Narcissus will bloom. Narcissus are easy to care for and look after in the garden. When flowering Narcissus should be watered during prolonged dry periods and fed with a low nitrogen fertilizer every spring. Once the Narcissus flower has finished blooming cut the stalks to the ground. 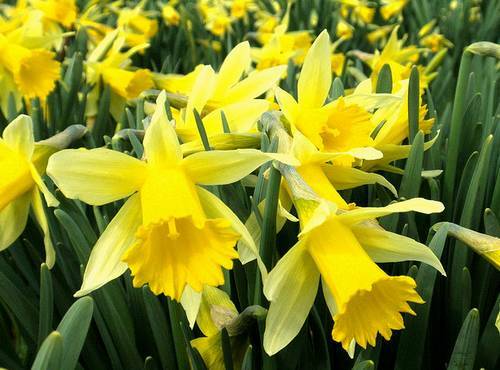 If you require more Narcissus plants then they can be propagated by dividing daffodils as soon as the foliage has died back completely.